Before you ignore this audiobook, thinking, “Here’s yet another guy telling me that my phone is bad, and I need to stop using it”, relax! This is not that audiobook. The issue isn’t technology itself. The issue is the attachment we have to technology. Former tech addict T.J. Burdick tells you how, in just 21 days, you can find a happier and holier life when you learn to control your phone, rather than letting it control you. This is not a 12-step program or a three-week detox in the woods with no Wi-Fi. 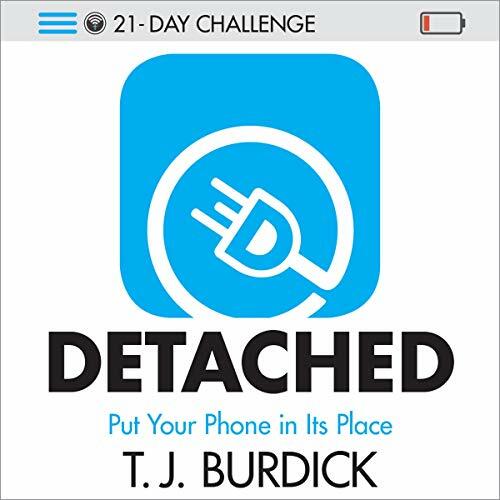 Detached is an easy-to-follow spiritual retreat, inviting you to listen, reflect, and take actions to strengthen your personal and spiritual life, while decreasing the time you feel you “need” to spend on your phone. About the author: T.J. Burdick is the author of several books and articles on the Catholic faith. He writes and speaks on how to grow in holiness among the distractions and difficulties of the current age. He resides in Grand Rapids, MI, with his wife and four children. So many great messages in this book for all of us who can’t seem to live without their device nearby. I’m as big as an offender as anyone, but this is full of good reminders about what is REALLY important!